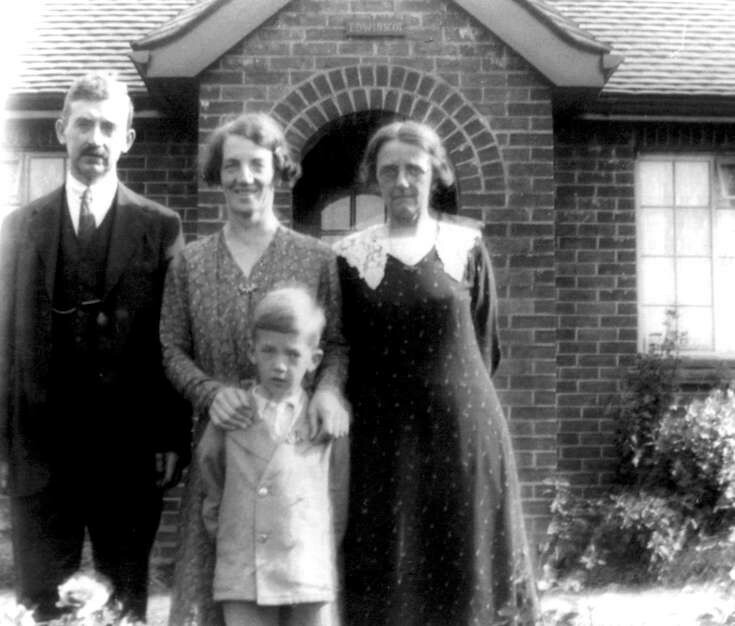 The photograph shows George Francis Biggs and Katie May “Kit” Biggs (née Sargeant) with their son, Norman Biggs, standing in front, and Florence Jenner (George’s sister) on the right. They are standing outside Edwinscot (now 17 Horsham Road), Pease Pottage. The bungalow was built as a 4-roomed [2-bedroomed] house and originally had no electricity, gas, sewerage or bathroom. Although integral to the house the lavatory was only accessible from outside. Cooking and heating was provided by a wood-fueled kitchen range, and most family life took place in the kitchen. The bungalow has changed substantially over the years; not least the porch and front door seen in the picture were bricked up in about 1985 and a new entrance was constructed to the right. I remember well that Mrs Biggs was a friend of our mother. She often looked after me when my mother was out. My second name is Norman.